Birdcicle is a microgame found in WarioWare: Touched! in the Total Drag stage. It later appears in WarioWare Gold as one of Orbulon's microgames. The name is a play on the words "bird", "icicle" and "popsicle". 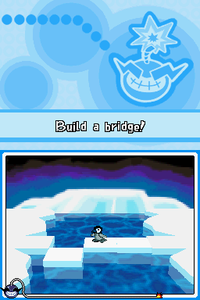 The objective is to drag the ice platforms to form a bridge for the penguin to cross. If the penguin falls into the water, the player will lose the microgame. 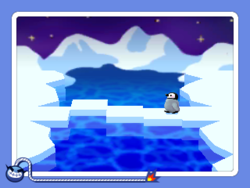 In WarioWare Gold, the player immediately wins when the ice bridge is fully in place, as the penguin will automatically jump up happily and slide away across the ice bridge. 1st level difficulty: There are three platforms, but one is already in place. 2nd level difficulty: There are three platforms that are further away from each other. 3rd level difficulty: There are four platforms that are further away from each other.